Easy, braise-y, beautiful. I’m a sucker for punny plays on words and easy weeknight recipes, so when I saw a Bon Appetit article claiming “These Braisey Chicken Legs in Coconut Milk Are Almost Too Easy to Make,” I was sold. 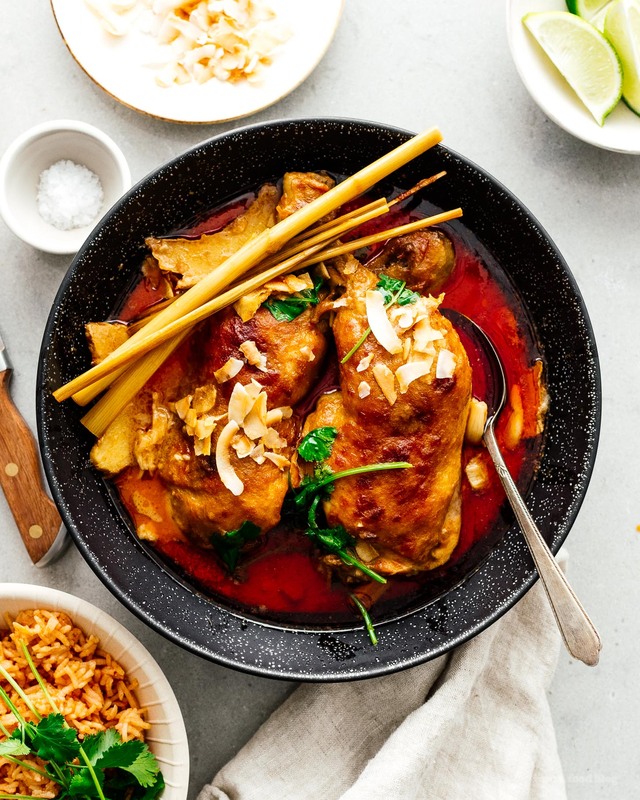 Of course it helped that the photo was gorgeous: deeply burnished chicken legs, golden brown coconut chips, and a coconutty red curry just begging for rice. The theory behind the recipe was: no chopping, no browning, just one dish. And you know what? It delivered. The chicken was tender and perfectly cooked and the ease of mixing up store bought curry paste and coconut milk was dead simple. I did tweak a couple of minute things though. First off, the recipe called for 1 cup of coconut milk. I don’t know about you, but I don’t have coconut milk hanging out in my fridge in a carton, conveniently waiting to be poured out into a 1 cup measure. Instead, I popped open a whole can of coconut milk, which is about 1 3/4 cups. I also upped the curry paste from 1 tablespoon to two, since I added so much more coconut milk. 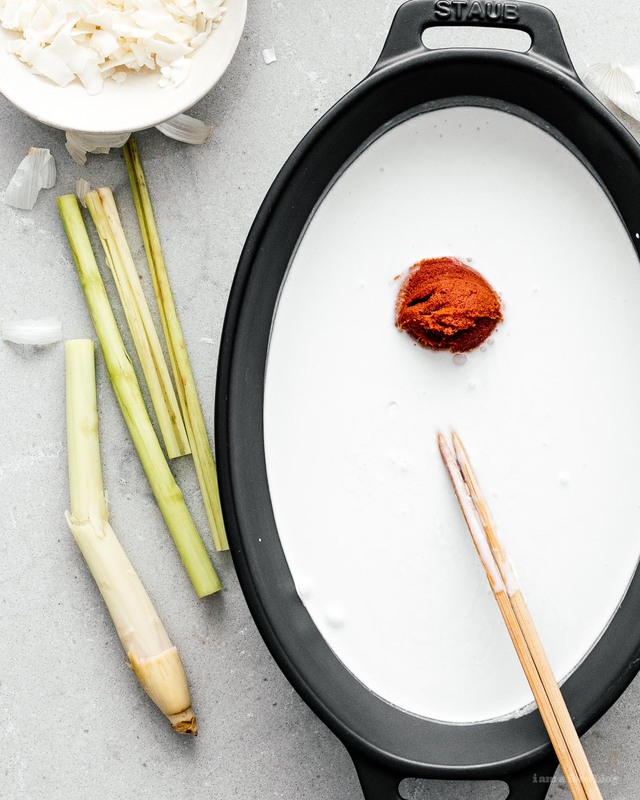 Pro tip: when mixing the curry paste into the coconut milk, just add a smallish bit of coconut milk to the roasting dish, then stir in the curry paste before adding in the rest of the coconut milk. It’s a lot easier stirring curry paste into a small amount of liquid as opposed to chasing your curry paste around the dish, trying to get it all evenly mixed in. I also skipped out on the salt. The original recipe has you salt the chicken legs before turning them in the coconut milk but I felt like it wouldn’t be needed (curry paste has a tendency to be quite salty) and justified it to myself by saying that I could season at the end, if needed. It wasn’t, in my case, as the curry paste I chose was super flavorful. Speaking of curry paste, I used Aroy-D Thai red curry paste – I love Aroy-D coconut milk so I figured their curry paste wouldn’t be a bad choice. It has a pretty simple ingredients list: chilis, garlic, lemongrass, shallots, salt, galangal, kafir lime, coriander, and cumin. Pretty much like what I would put into a curry paste if I wasn’t making a weeknight dinner. Other than that, I stayed pretty true to the original recipe. Oh wait, I did slice up the ginger instead of peeling and smashing. I forwent the peeling, giving the ginger a good wash, and simply sliced it thinly to expose more of the ginger to the coconut curry. More ginger surface area equals more ginger flavor. And since we weren’t planning on eating the ginger, it was a no brainer to give it a good scrub instead of peeling. 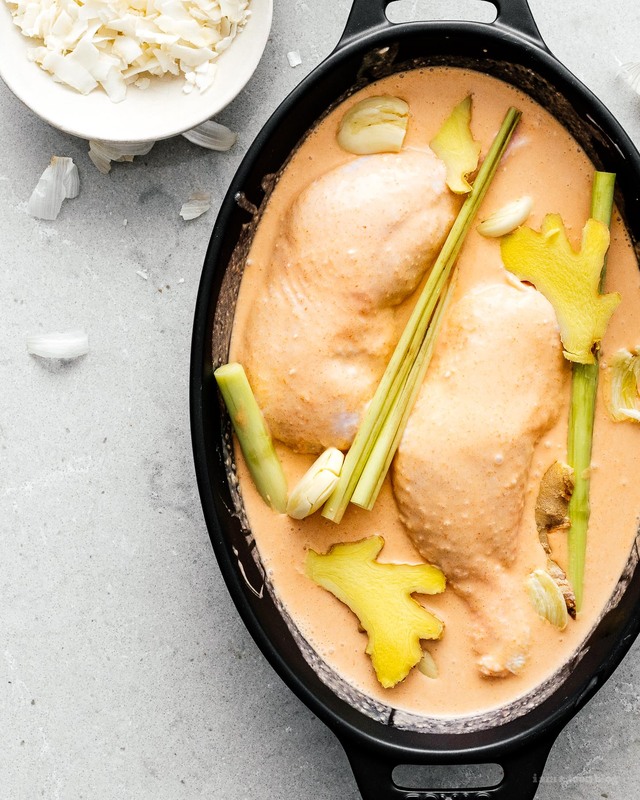 After an hour of roasting in the oven, the coconut milk spilt and there were glorious slicks of red oil pooled on top of the slightly thickened coconut milk – the sign of a really good curry, if you’re asking Malaysians or Singaporeans or Thai or Indians. You want your coconut milk and spices to split into two: a flavorful infused oil and a rich, dense, coconut base. When your curry splits, its means that all of the excess water that was in the coconut milk has evaporated and concentrated, leaving all the good stuff. 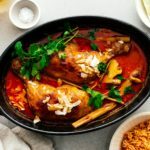 All in all, this recipe is perfect for those nights when you get home from work and want to do nothing while dinner is cooking. Pop a couple of things into a roasting dish, then watch an episode on Netflix while you wait for dinner to be done. When the timer goes off, make a bowl to eat on the couch while you binge watch the rest of your night away. All your worries will fly away. All of them except spilling on yourself, that is. 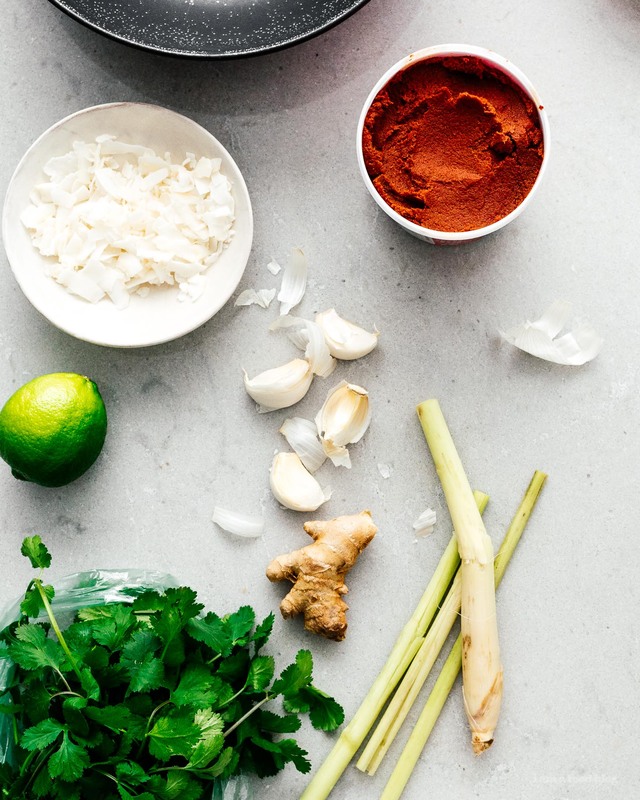 PS – For those nights when you have a little more time, try this from scratch Malaysian curry chicken. PPS – I feel like the toasted coconut chips are very optional. While they did add a bit of crunch, I didn’t think they were worth the extra 5 minutes at the grocery store to find. But if you’re into #aesthetics, you can find large coconut flakes in bulk at Whole Foods. Just pop them on your chicken during the last 5 minutes of roasting for them to brown and crisp up. Or, you know, you could buy those expensive coconut chips that are already toasted, you do you. Move a rack to the top third of your oven and heat to 400°F. In a 2 quart baking dish (or skillet), stir together a bit of the coconut milk and curry paste until smooth. Stir in the remaining coconut milk. Add the lemongrass, ginger, and garlic. 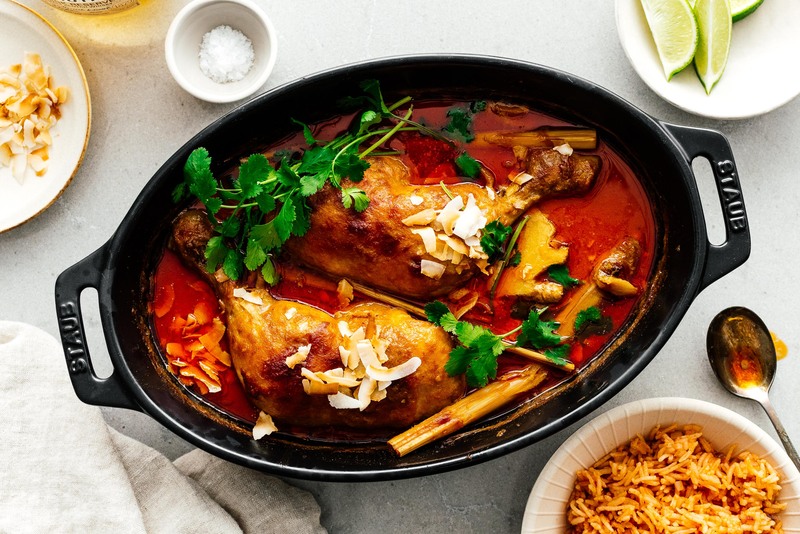 Coat the chicken in the coconut curry mix, nestle them together, skin side up, and bake, occasionally spooning curry on top of the legs, until the chicken is golden, tender, and cooked through, about 1 hour. Remove from the oven and top with cilantro and enjoy with rice and lime. this recipe is AMAZING and so incredibly easy to make. Thank you! Say you only had green curry paste. Would you change anything?